The term refers to the learned guides helping foreign visitors to European museums and galleries from the 18th century onwards, possibly derived from the Roman scholar Cicero. In response to this comment Steele wrote an explanation of his approach, how it came about and its implications, for The Anglo-Welsh Review, published in December 1967. Full text and illustrations in PDF form (large file). He begins by remembering that his secondary school in Cardiff did not allow A-stream pupils to take art so at the age of 12 he had to drop down to the B-stream to study it. This has led to artists being persecuted or treated as “saintly half-wits” and insulated from responsibility in the running of the community, and most artists acquiesced in this. He wants to abolish this rift between the artist and society. He says his years at art college (1948-52) were “completely ruined” by its “Victorian academicism” and lack of cognisance of art developments from Cézanne onwards. (This attitude to art education in Britain was to change markedly in the early 1960s.) He reacted to this in a “violent and negative way”, and the experience left him ill-equipped to develop as an artist in the 1950s. For him this was a period of “false starts and a feeling of artistic impotence”. He was impressed by abstract expressionism but “distrusted the deliberate bypassing of the thinking part of the mind which gestural painting entails”. He inclined to a more austere and rational approach, exemplified by the work of Malevich and Mondrian, but he “knew of no satisfactory contemporary development out of the work of these pioneers”. 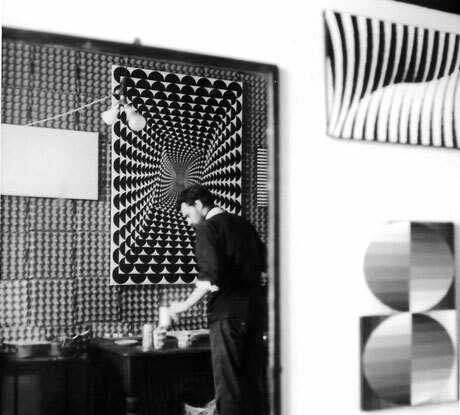 In Paris in 1959 he found the work of Josef Albers, Herbin, Max Bill, Richard Lohse, Vasarely, JR Soto and others who “taught me the value of a systematic approach to painting and I definitively resolved to proceed from there on by controlled and logical experimentation”. He produced a series of paintings “in which my aim was to exploit the area of tension between a given idea as a concept in the mind and the experience of it as a sensation”. He refers to his work Hantise (1961): “I believe I found the critical point where maximum simplicity equals maximum aesthetic effect”. Hantise ("Haunting" in French) was bought by Newport art college, the same college from which Steele had failed to graduate, and hung in the office of the principal, John Wright, while Steele taught at the college in the mid-1960s. Steele discovered that other artists were working in the same way, such as Dieter Roth (Diter Rot), a German living in Iceland, Julije Knifer in Croatia, and Bridget Riley in England. He talks of the perceptual mechanisms involved in observation and recognition and says he tried to “balance numerous possibilities for appraisal” in order to block a resolution into identification, “thus bringing the spectator’s optical dynamics into play, into value, much as in ju-jitsu one’s opponent’s strength is used against himself”. 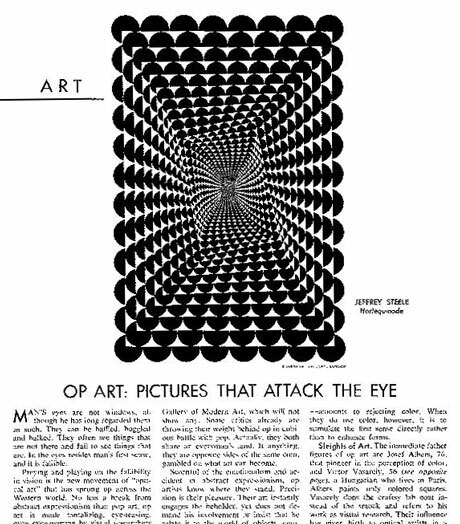 He refers to the “Responsive Eye” exhibition in New York in which he had participated and quotes its organiser, William Seitz, on optical effects. At first he saw these powerful effects such as dazzle and vibration as an “exciting weapon” which “increased the capacity of a possibly too dry and cerebral art form to provoke sensation in the spectator and so generate an aesthetic response”. 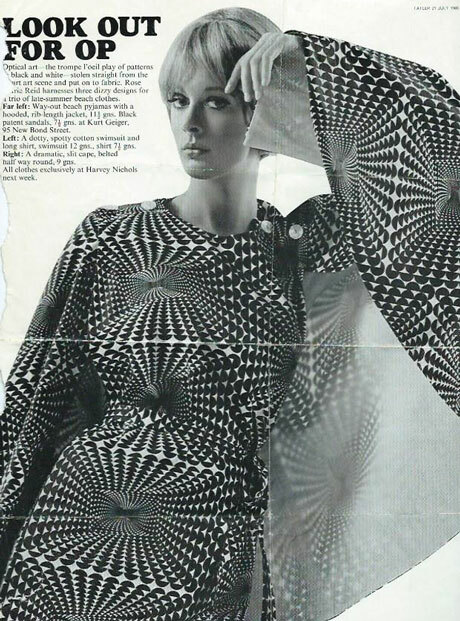 But because of the interest of the popular press and the fashion industry in op-art this approach became “almost a liability”. He says the “normal percolation process of visual ideas” down from serious criticism and analysis was reversed. He compares “pop art” and “op art”, terms whose similarity meant their approaches were “misleadingly harnessed as opposite sides of the same coin”. He says that “both cater simultaneously for primitive and sophisticated levels of appreciation” but “in pop art the naive and elite interpretations are opposed to one another”. He quotes the Spanish philosopher José Ortega y Gasset in his essay “The Dehumanization of Art”, saying this opposition is “like a social agent which segregates from the shapeless mass of the many two different castes of men”. 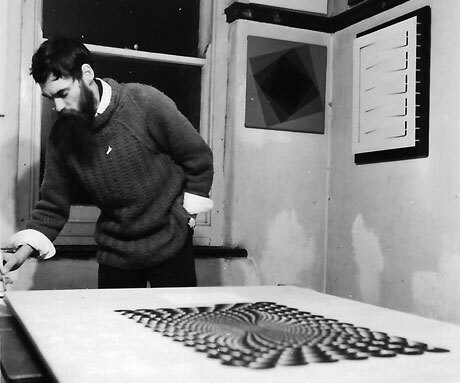 In contrast, op art “may be seen as a potential integrating agent since each layer of significance holds the key to the next and harmonious transition from one plane to another is possible”. He says he realised in New York that “our moment in the sun/circus ring would be brief”. He refers to two “warring factions” operating in any art of art which are mutually destructive: one is the “feeling of heightened awareness which accompanies the reception of aesthetic information”; the other is the “play of the artist’s unconscious upon that of the spectator”, which results in a “hypnotic fascination“ and which he likens to the “inflamed excitement associated with, say, a bullfight or a James Bond film”. He contrast this with “a infantile craving for the artist to purvey a soft feather bed for the spectator’s fantasies through the skilful practice of a traditional craft”. He acknowledges that the artist “cannot provide solutions to any problems outside his art” but he believes art can be “a vehicle for the transmission of a contemporary idea of truth in the human mind if its inevitable literary connotations can be firmly related to this primary object”. He mentions aspects of his paintings such as shape, edge, metamorphosis, super-imposition, waves, ratio, symmetry, progression, repetition, optical nuances and illusions, and “perspectives and trajectories behind, before and around the picture plane”. He says his works could be translated into “words, symbols and formulae”. This “renders feasible the extension and the scope of an idea within the terms of its original proposition by the use of computers, which could thereby both assist and clarify the creative process itself”. 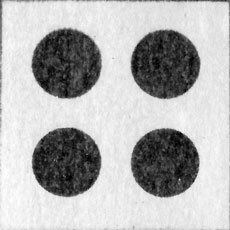 For example, “a static proposition could be transposed into movement; two dimensions into three; flat, black and white lines and shapes into colours, lights and sounds”. Baroque Experiment was painted at a time when Jeffrey Steele was unexpectedly a single parent of two young children after his wife, Glenda, fell ill. He also had a morning job as a radio station operator. 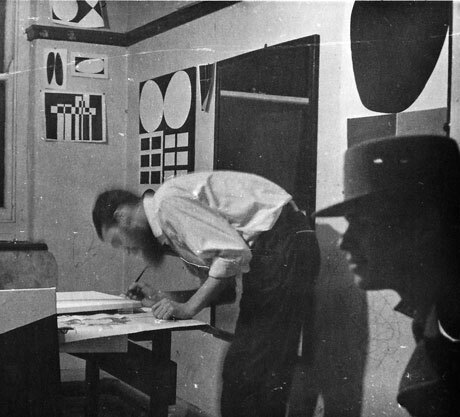 To give him time to paint his friend Fred Maddox, an artist who had sublet some studio space from Steele, offered to look after the children in the afternoons. Without this the painting could not have been completed. It was drawn in autumn 1962 and painted in January to July 1963. It was exhibited several times in Britain including at the Grabowski gallery in Kensington, London, in 1964. An image of it was among material taken to the United States by an associate and shown to Americans in the art world. This influenced the Time magazine article and the inclusion of the painting in “The Responsive Eye” in New York. Steele took time off from his job (by then he was an art teacher) to visit New York for the show. He spent some weeks in the city, staying at the Chelsea hotel, and met many artists and critics. The painting was held in private collections in Britain until recently. It was shown in an exhibition in Sao Paulo, Brazil, in 2011 and bought by a South American collector. A three-part televison documentary was made of the “Responsive Eye” show. It can be viewed on YouTube. The American film-maker Brian De Palma made a documentary on the show in which he interviewed Steele. This is on the UbuWeb arts website. This website was created by Jeffrey Steele’s son, Simon Steele, with the artist’s assistance. Contact: Osborne Samuel gallery or email jeffrey@jeffreysteele.co.uk.